Time for dessert!!! I enjoy wheat beer and one with the added flavor of blackberries is not something to be enjoyed with a meal but a nice after dinner snack – if beer can be a snack. 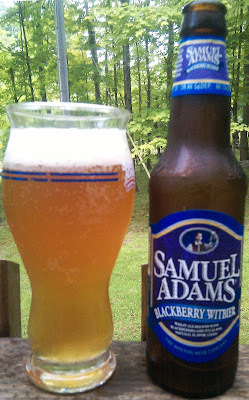 Very nice light beer with a hint of blackberry flavor in the aftertaste. Not something that I would drink regularly but I have to say I enjoyed this one. Blackberries are out in abundance around my house this time of year and we have been enjoying them for weeks. Brewers Description: Our take on a classic witbier brewed with Oregon Marion blackberries to give the beer a subtle sweetness. To create our version of the traditional witbier style, we wanted to complement the style’s natural wheat and traditional citrus flavors with the sweetness and tartness of blackberries. We looked for the perfect variety of blackberries that could offer the balance in flavor without becoming overpowering. The Oregon Marion blackberries were the perfect fit; selected from family farms located at the foot of the Oregon Trail and Cascade Mountains in Western Oregon, where they have been growing some of the best blackberries in the world for generations. The blackberries are brought together with a hint of traditional orange and coriander to complement the malt character and give a smooth finish that’s both sweet and tart.